And pay the consequences…today I’m on a roll about parenting, due to some pretty extraordinary examples of how not to do it that I find myself witnessing on a daily basis. I know each of us is different, and that each family unit is different too. I can’t help feeling though, that there are some very basic basics about what is right in rearing a child. I’m talking about health and safety, for starters. Things that seem common sensicle, if you get my meaning…at least to me. First and foremost, a child needs nutrition and rest. That means eating healthy foods with a few treats thrown in- a habit that would certainly put paid to our obesity issue. Also, at our house, bed times were consistent pretty much right through middle school: 10-12 hours of sleep every night. It gave us a routine that allowed hubby and me some private time as an added benefit. Woe to the person who called me on the phone between six and 7:30 p.m.- that was dinner, bath, story time, prayers and last hugs. Every night. Woe to the child who called for me after that up until morning- there had better be blood and guts involved. That routine was sacred. From the time our children were eating solid food, hubby and I spent the time to make everything fresh and from scratch. Sunday nights our kitchen became an assembly line as we prepared veggies, fruit, and meats, and placed them in small freezable bags or ice cube trays. This made the week’s meals super easy. Our babies came into their eating time at the period where glass was found in Gerber’s food jars, and the Beechnut Apple Juice was found to be colored sugar water. We didn’t trust anyone with our babies’ health. Admittedly, I was over the top about keeping the kids away from junk food. Even our birthday parties were all healthy with a bit of junk on the side. It’s cheaper and easier to feed the kids well; they also get used to whatever hits their pallets first. If the child is weaned on McDonald’s, she or he will not be as naturally drawn to or accepting of healthier alternatives. In school, I’m a tyrant for this as well, and have had several arguments with parents about class celebrations. One parent insisted the children would never eat the fruit salad I asked for while other classes were gnawing on cookies and candy. She was astonished to watch the children devour and fight over orange slices and carrot sticks. A lot of it is in presentation. 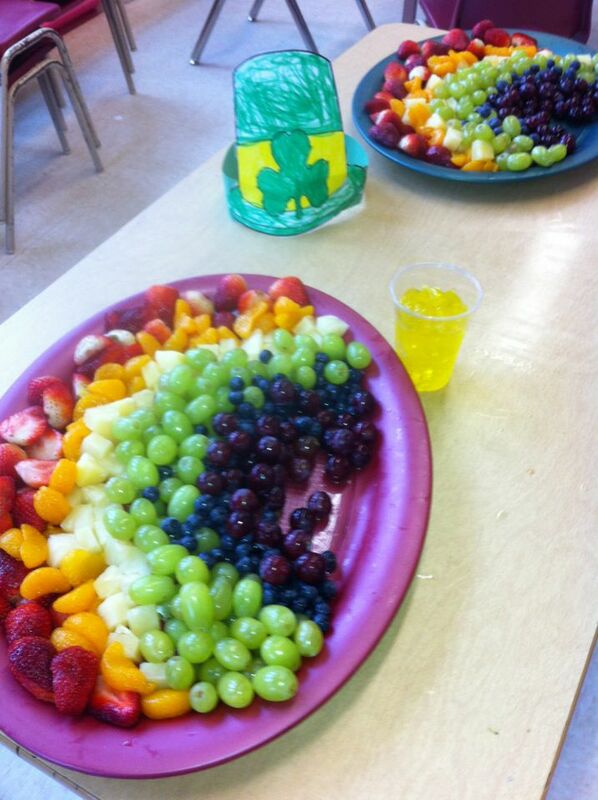 The photo below shows a St. Patrick’s Day celebration in my kinder class last year. At the end, there was nothing left on the platter. When a parent sends in cupcakes for a birthday snack, I serve it to the children fifteen minutes before dismissal. The parents can deal with that sugar rush; not me. Second, and very high up on the list is discipline. Children need boundaries and routines. They feel safe knowing that the boundaries are there, and it means that the adults care enough to keep them safe. They act like they hate you for it, they even tell you that they hate you for it; but they depend on us to make sure they are taken care of. This is why they act out constantly- they are testing the limits to make sure they are there, much the same way my dog tests the electric fence everyday. If the battery is dead because I abdicated my responsibility to keep it working, the dog will run away and possibly get hurt or eat something deadly. My fault. When parents try to befriend their kids, they fail them. When they choose rationalizing discussions over consequences, they fail them. When they treat their kids like adults with the same thought processes, they fail them. Be the adult- teach your children right from wrong; teach them that the universe does not revolve around them; teach them the golden rule. What kind of adult do you want them to be? Parents should start there and work backwards to make decisions on disciplining their kids. Finally, let the kids develop, with guidance and love, into the adults they are meant to become. I’ve had many parents dread the idea that their sons might be gay. I’ve had many who asked, when the child was in first grade, whether I thought he or she was Ivy League material. Our world needs an infinite number of different people to fill all of our collective needs. The artist is as important as the business owner, and the teacher is certainly as important as the lawyer or the doctor. Love your children, guide them, teach them to be positive and kind, and help them find their way. You won’t always be there for them- you are doing them a favor when you teach them independence and interdependence, passion and motivation, generosity and social skills. You are doing the rest of us a favor as well.